A round-up of links for you! Documents: DocStoc has free legal and business documents that you can download. Succeed: 10 Secrets to Success. I am on the planning committee for the PSFK conference, and I highly recommend attending. It is March 27 at the Art Director’s Club. The PSFK conference is a convergence of creative ideas, trends, social media and online ephemera. Chef Eric Ripert, Graham Hill from Treehugger, and Josh Spear are among the speakers/panelists. I will be there volunteering in a purple shirt, so stop by and hello. In the meantime, check out PSFK.com for daily bits of trends and news. Lately, the world financial news has been grim, and the “R” word, recession, has been whispered or mumbled about. There is no need to panic, but it the right time to be proactive. The U.S. Congress is reviewing a economic stimulus package that may provide tax payers a rebate of $300-$1200, depending on one’s tax bracket and claimed dependents. The stimulus package is not immediate, so work now to reduce expenses. Even if business slows down, you can still meet profit goals and/or minimum loss but watching your expenses. If you are using Quickbooks, you can run “QuickReports” on each of the expense accounts listed in your Chart of Accounts. Review these reports to see if they are out of sync with what the business can afford or over budget. In addition, if you have preferred vendors, then maybe you can negotiate discounts which will be a win-win since your vendor would appreciate your regular business. Another way to save is to become a member of a retailer’s rewards club. Staples and Barnes and Noble are two retailers that come to mind, but there are plenty others. Check out the list I curated on This Next. It’s a list of books, office supplies and software that may help small business owners and freelancers. BTW, I am looking for a good, inexpensive all-in-one printer to buy so let me know if have any recommendations. Confess: Geezeo has a Twitter group, Money Confession, where people can anonymously confess their money woes. It is kinda like debtor’s anonymous on Web 2.0 crack. Estimate: Start now to figure out to get a free estimate of your tax bill/refund by using H&R Block’s tax calculator. 1099-MISC (Miscellaneous Income) form needs to be issued by your business when you pay independent contractors $600 or more for services. You can purchase the forms cheaply at Staples. Make sure to purchase 1099-MISC forms. I was in a rush the other day and picked up 1099-INT forms. To complete the forms, you need a list of all the independent contractors, their current address and social security number. If you are using Quickbooks, you can run a 1099 vendor report to get a list of the total amount paid to vendors. If you don’t use Quickbooks or another accounting system, then just review your check register and add up all payments made to each independent contractors. The deadline for issuing 1099 forms is in two weeks, so get the forms now! Yesterday, I worked at one of my clients, Kim Ima of the Treats Truck. 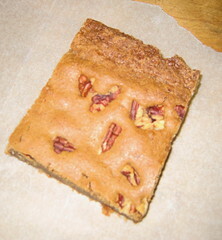 She gave me a delicious butterscotch pecan brownie. Sometimes bookkeeping is sweet. The cool thing about Quickbooks Pro is that if you set up your Charts Of Accounts properly, you can do cost analysis of your materials like sugar, butter, flour, and run “Quick Reports” on the accounts. If your business has many elements to create a final product or final deliverable for a service, then it is essential to break each of the elements and categorize them as Cost of Goods Sold. Then you can review a “Quick Report” on each element and see if these costs are proper and how they affect your profit margin. Review your costs may cause to raise your prices/fees or seek out new vendors that are less expensive.